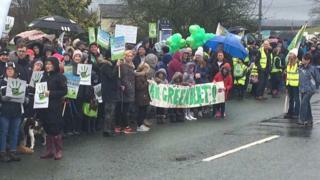 About 4,000 people have demonstrated against plans to build on green sites in Greater Manchester. In January, it was announced that about 201,000 homes could be built in the region by 2038 to tackle the "housing crisis". Green belt land, which forms 47% of Greater Manchester, would be cut to 45% if the plans are approved. A spokesman for Greater Manchester Combined Authority (GMCA) said it had "a legal duty to provide homes". What are green belt and brownfield sites? Green belts were introduced after World War Two to stop cities from sprawling and countryside being spoilt. There are tight controls on building in these areas. In 2018, about 12.5% - 1,629,510 hectares - of England's land area was designated as green belt. Brownfield sites are usually on disused land, but they are often more expensive to build on as it needs to be cleared first. Steve Lord, who helped organise the protest in Tandle Hill Country Park, Oldham, said: "We understand the need for affordable homes - there is a housing crisis... but not at the expense of this cherished green belt where, in Shaw and High Crompton, it's draconian, it's criminal and dangerous." Kate Clegg, who also attended the rally, said: "There are so many brownfield sites in Milnrow that could provide genuine affordable houses. "The types of houses they are building, my children won't be able to buy when they are older." A GMCA spokesman said: "We have a legal duty to provide homes for people, but we also want to protect our green spaces. "We believe that using green belt should always be a last resort, and we're doing everything we can to increase the land available for development within our existing towns and neighbourhoods, while minimising the impact on our green spaces." The plans - known as Greater Manchester Spatial Framework - follow huge protests and 27,000 responses in a consultation over a 2016 proposal for 225,000 new properties. Concerns were raised over congestion, affordability of homes, and the development of green sites instead of brownfield land. The GMCA says the new plan "is based on the assumption that 201,000 additional homes will be required up until 2037... based on an anticipated population growth in Greater Manchester over the period of the plan of 250,000 people". The region's mayor Andy Burnham has previously said they would include 50,000 "affordable homes" - of which 30,000 would be social housing. Latest proposals include more accommodation in town centres and the release of brownfield sites for development. Members of the public can take part in a consultation until 18 March.